I have always had a fond appreciation for .300BA, 30HR, 100 RBI guys. Any way you slice it, that is solid production that any team in the league would appreciate having on their roster at multiple positions. 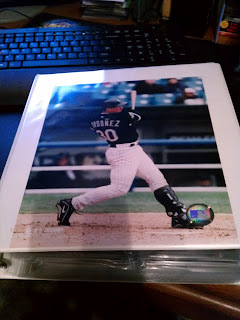 So it was with my White Sox and Magglio Ordonez when I really started ramping up my collecting pursuits 10+ years ago and at the time I heavily pursued his cards. Unfortunately for me, when Ozzie Guillen became manager, Ordonez was one of the first pieces to be moved in the Sox quest for their eventual championship in 2005. Being prone to injury, a defensive liability possessing a lack of situational hitting and base running skills, coupled with his salary, doomed the slugger as he became the poster boy for the antithesis of what Guillen wanted in his players. Trading Ordonez for an eventual World Series Championship was well worth the sacrifice however. I have what I feel is a pretty nice Ordonez collection, but as you know I am focusing on quality over quantity at this point in my collecting career and it is now time to pass this player collection on to someone who will appreciate it. 2003 Topps Tribute Contemporary Collection, Modern Marks on card auto. Key Game Used Card is the 2002 Fleer Flair Sweet Swatch over-sized jersey card featuring a jumbo 2-color pinstripe swatch. The collection is housed in a binder with a sweet color 8"x10" MLB authentic photograph on the cover.